So I am working on developing my sense of humor. I can be a deep thinker, and have learned over the years to value meaningful, focused study. There are so many health benefits attributed to laughter and lightheartedness that we can’t ignore its importance. How do those of us who’s Netflix list consists of documentaries bring more comedy into our lives? Well, I suppose it’s just like anything else, -we pursue it intentionally! When writing Lenora’s Bequest: Lessons Learned From Watching My Sister Finish Well, I included an entire chapter entitled “Giggle”. Those of us who are perfectly content being the super-serious members of society really do need an occasional reminder to keep our spirits light. My social media feeds are set up to show the funny and positive stories first. No depressing newsfeeds for this lady! My daughters use their millennial superpowers to scan the world and keep me abreast of viral videos that make me “weak”, which is their word for “doubled over laughing hysterically”. In my downtime, instead of clicking on CNN, I engage the headlines only after watching a silly sitcom or a funny show. A conversation with a funny friend is simply a lifeline! I alternate genres (Action-Drama-Comedy) so that I am not seeing too many serious movies over a period of time. Thankfully, my husband is naturally funny. On top of his amazing sense of humor, Steve also brings out the funny in me. When life gets too busy, he is also willing to bring the funny directly to me! 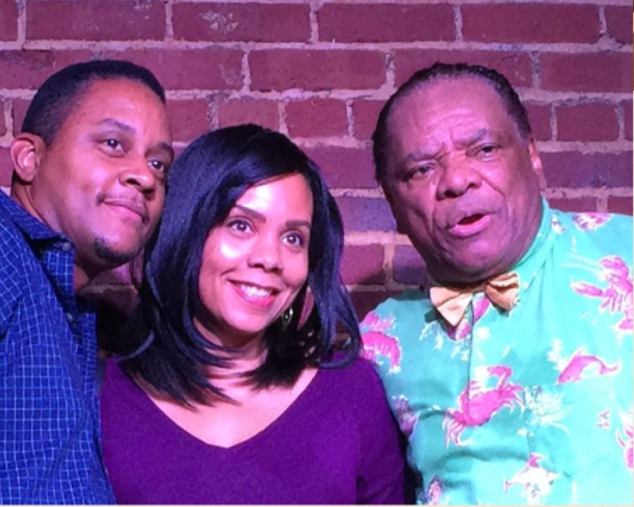 This was the case recently when he insisted that we go out to see comedian John Witherspoon, often referred to as “Spoon”, or “Pops”. Witherspoon’s IMDb resume dates back to The Richard Pryor Television Show, yet he is still working in television (Black-ish) and movies, as well as touring as an A-list comic. His lesser known work as Spoon on The Tracy Morgan Show was some of his funniest (and cleanest) work in my opinion. I always feel a little sad for stand up comedians, because it seems such a lonely life on the road. Stand up comedy material is often dark and seems to come from a place of pain. Still, it was awesome to meet John Witherspoon, who at age seventy-five seems spry, sharp, and shows no signs of slowing down. He put on a great show! Perhaps making people laugh holds as many health benefits as laughter itself. Let’s test this theory. Two men walk into a bar….No? Well, feel free to leave your joke as a comment and I’ll shout out the funniest. Keep laughing, and stay well! Witherspoon is naturally funny! While we were talking the photo, the jokes kept rolling! We are are also fans of the Mann’s!